Why did Jesus say that those who mourn will be blessed? How is that possible? When Jesus gave the Sermon on the Mount, and spoke the Beatitudes, His audience must have been shocked. Jesus told them things that were contrary to the way the Jewish religious leaders taught. For example, He said, “You have heard that it was said, ‘You shall love your neighbor and hate your enemy’” (Matt 5:43), but Jesus turns that teaching on its head by saying, “Love your enemies and pray for those who persecute you” (Matt 5:44). Perhaps this was what the people were taught. For example, the Jews were taught from their youth to hate the Samaritans, considering them half-breeds, but Jesus said we are to love our enemy, and even pray for them, but why? Jesus said it is “so that you may be sons of your Father who is in heaven. For he makes his sun rise on the evil and on the good, and sends rain on the just and on the unjust” (Matt 5:45). God gives His common grace to the good and to the evil, so we should be doing the same by loving our enemies and praying for our persecutors. That’s the last thing the Jewish leaders would have ever done. This is why the Sermon on the Mount was so radical in its day, and even more so, today. It’s radical because God’s love is so radical (John 3:16). 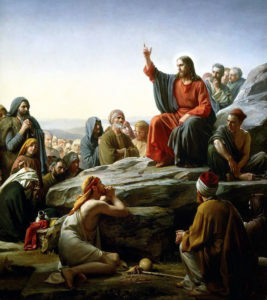 Jesus teaching at the Sermon on the Mount by Carl Bloch (Pubic Domain). Jesus told His disciples that it is by their love for one another that people, all people in fact, will know who His disciples are (John 13:34-35). Many of the ancient laws of Israel were included things like “an eye for an eye” (Ex 21:24), which is fine when it comes to taking someone’s life. God’s law included capital punishment. When someone murdered another person, their life was required, so with the backdrop of this knowledge, Jesus said, “You have heard that it was said to those of old, ‘You shall not murder; and whoever murders will be liable to judgment.’ But I say to you that everyone who is angry with his brother will be liable to judgment; whoever insults his brother will be liable to the council; and whoever says, ‘You fool!’ will be liable to the hell of fire” (Matt 5:21-22). Jesus reminds us that “whatever you wish that others would do to you, do also to them, for this is the Law and the Prophets” (Matt 7:12). This doesn’t mean that if someone slaps you in the fact, you “do also to them.” That’s just the opposite of what Jesus taught. If we are angry without a cause and despise and show hatred for our brothers and sisters, then we are committing murder in our hearts, basically. It is similar to committing adultery of the heart without doing the physical act because by lusting after someone who’s not our spouse, we are as good as committing adultery in our thoughts and mind. Jesus said, “Blessed are those who mourn, for they shall be comforted” (Matt 5:4), but what mourning was Jesus talking about? Was it mourning over someone who died? Was it mourning over someone that’s left us? I think Jesus may be speaking about mourning over our own sins, and perhaps mourning over the sinful depravity that they see in the world, but I believe it’s to be taken personally. Those who mourn over their own sins will be comforted because they know they’ll be forgiven if the confess their sins to God (1 John 1:9), but I believe those who mourn over this sinful world will be comforted too. Those who mourn over ruined relationships will be comforted. Whatever we might mourn over, we will eventually be comforted. It may not come in this world, but it will come. Jesus has said so. The psalmist had tears streaming down his face because the people were breaking God’s law (Psalm 119:136), so he was mourning over the sin he saw in the world, so Jesus could be speaking about mourning over this sinful world, mourning over our own sins, and/or mourning over the death of someone, so how could a person who’s mourning be blessed? First of all, those who had trusted in Christ in this life, and have gone on into glory, are present with the Lord (2 Cor 5:8). They’re waiting for us. We should be comforted knowing that our dearly, departed ones are not gone…they’re just not here. God is the God of the living and not the dead. For believers, it is not goodbye but “See you later.” That’s hope! That’s comforting, and that’s a blessing for our hearts. Jesus Himself was grieved by the sinful depravity of some of the Jewish religious leaders. That’s because they trusted in their own works as their own righteousness, and not the righteous ness of Christ (Luke 18:9). 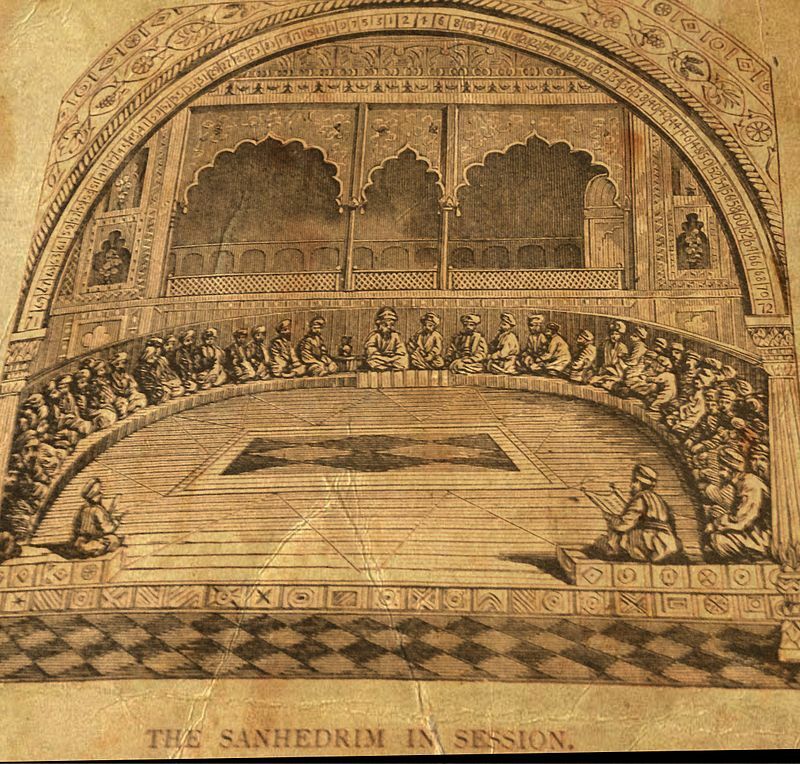 The Sanhedrin, from an 1883 encyclopedia. Jesus turned this world’s ways upside down, but really we could say, He turned it right side up because it’s the world that’s fallen. Jesus’ Beatitudes in the Sermon on the Mount turned the conventional religious crowd on its head. They had never heard anything so radical in all their lives, and that’s why Jesus spoke such hard words at times. He would speak soft words to soft hearts, but He spoke hard words to soften the hard hearts of the Jewish religious leaders. Their hearts were so hardened that they refused to see that Jesus was the perfect fulfillment the Messiah, including the miraculous signs and wonders. Even with all this, they openly rejected Him, and so they have no excuse. 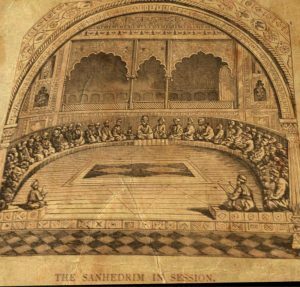 There is no evidence that they ever mourned over anything or anyone, especially their sins. That’s too bad because they’ve missed out on a blessing. I pray you won’t reject the only way you can be saved (Acts 4:12), and the only way into the Kingdom (John 6:44). Blessed are those who mourn, because comfort is coming…, but in the meantime, we mourn over our sins and repent of them immediately. We mourn over the sinful state of this evil world. We mourn those we’ve lost but are comforted in knowing we’ll see them again, but we mourn for those who still refuse to come to Jesus and be saved. Let us pray for those who have rejected Christ. Pray for God’s Spirit to quicken them to new life in Jesus Christ (Eph 2:1-4). And be comforted, knowing that every tear, every sorrow, every pain, and even death itself is coming to an end (Rev 21:4), so we can say with assurance that, “Blessed are those who mourn, for they shall be comforted” (Matt 5:4). That’s comforting, isn’t it?